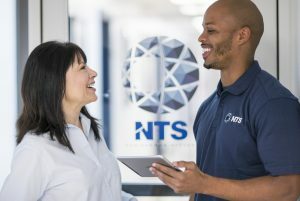 NTS Tempe has now added additional capacity and capability in its EMI/EMC department. 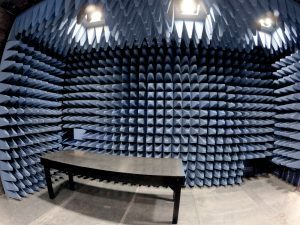 A new, larger semi-anechoic chamber has been constructed. It has a nominal size of 24’w x 28’l x 12’h and is lined with ferrite panels and Cuming Microwave C-RAM SFC non-flammable Pyramidal absorbers. It meets MIL-STD-461 and RTCA/DO-160 requirements through 40 GHz. 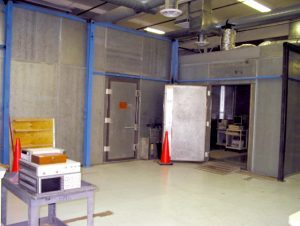 The chamber features two large doors which allow testing of much bigger test articles and assemblies. LED lighting provides excellent visibility throughout the room. Convertible benches and penetration panels at multiple locations around the room allow for support of multiple configurations. In addition, we have added a fully shielded control room, central to all three chambers that allows for customer support equipment to be operated in a noise-free environment. The work space in the building has been reconfigured, allowing additional room for customer work space, with privacy cubicles and internet connection, phones, etc. The Tempe EMI/EMC department has also recently added a Thermo Fisher ECAT Lightning Test System that is designed to provide a modular test platform based on the lightning simulator requirements of RTCA DO-160 Section 22 for aircraft and aerospace. This system is expandable to meet Boeing, Airbus, EUROCAE and other requirements, and because of its modular configuration, can be easily upgraded as requirements change. The Thermo Fisher Scientific ECAT Lightning Test System (LTS) is configured as three basic test systems, each of which is available as a Level 3, Level 4, or Level 5 tester. All test systems feature both single-stroke and multiple-stroke test capability. Each system configuration provides test capabilities to Level 3 for pin injection, cable bundle, and single- and multiple-stroke testing. Each is expandable up to Level 5 for all waveforms, including Waveforms 3H and 6H for multi-burst testing, both of which can be added to any system configuration. All systems are upgradeable to higher levels at any time. The modular construction allows for easy addition of new waveform modules in the future. 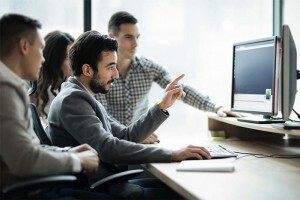 These changes and others in the Tempe EMI/EMC lab provide for greater capacity, expanded capability, and a better testing experience for our customers. Come in and see the changes we have made!